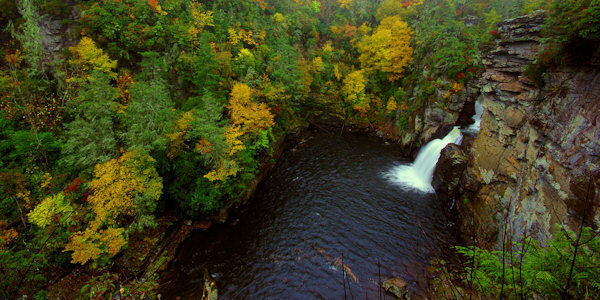 Linville Falls is probably the most photographed waterfall in North Carolina. It is located on the Blue Ridge Parkway near Milepost 316.4, about 66 miles north of Asheville. You can hike to five viewpoints via two trails leaving from the Visitors Center (1.5 miles drive from the Parkway). The Visitors Cener offers restrooms, a picnic area and an information center (open May-October and weekends in April). 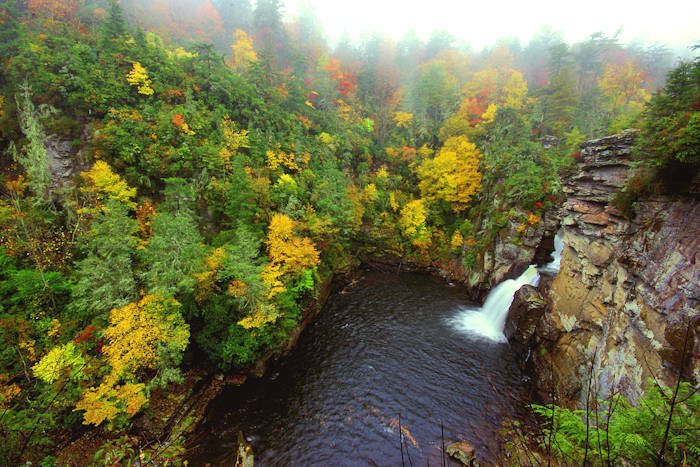 Located in Burke County, Linville Falls drops 90 ft. into the 12-mile long Linville Gorge with cliffs towering above the river. Only one of the trails is strenuous, and you can hike to all five viewpoints with a four-mile hike. A second parking area is near the village of Linville Falls in Pisgah National Forest - a great option for winter hikes when the Parkway is closed (read more). In addition to hiking, find a campground along the Parkway access road. 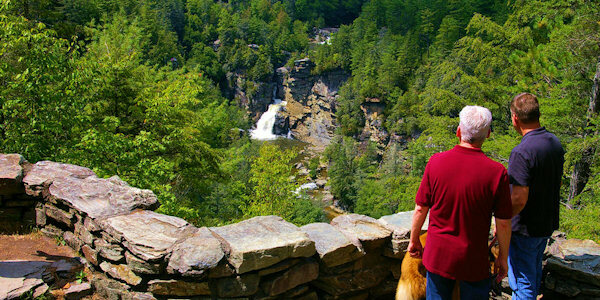 The Linville Falls picnic area is directly on the Parkway. See hiking details below! 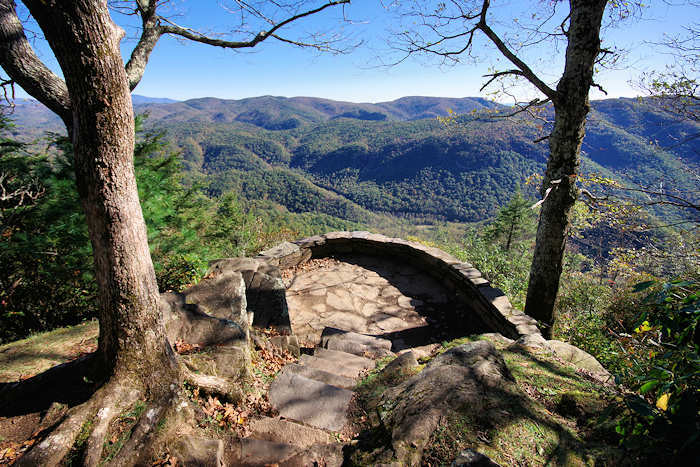 Erwins View Trail, a moderate hike of 1.6 miles round-trip from the Visitors Center, offers four overlooks, each revealing a different aspect of the Linville Falls area. The first overlook of Upper Falls is 1/2 mile from the Visitors Center, and is an easy walk with a slight loss of elevation. At the Upper Falls overlook, stand below the small cascades and watch the water rush into a narrow canyon before it plunges 45 ft. over the lower falls. Continue on the Erwins View Trail for another quarter mile to reach the next overlook, Chimney View. This is the first point on the trail where the lower falls can be seen. 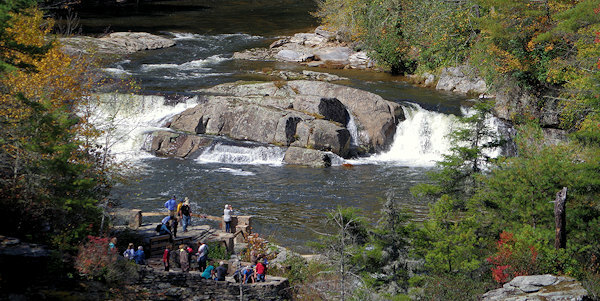 Above is a zoomed-in photo the Upper Falls observation area from the Chimney View. It offers an excellent chance to photograph both the upper and lower falls, along with the impressive cliffs. The overlook is named for the chimney-like outcroppings located to the right of the waterfall. The Erwins View Trail ends at Erwins View Overlook, less than a mile from the Visitors Center. 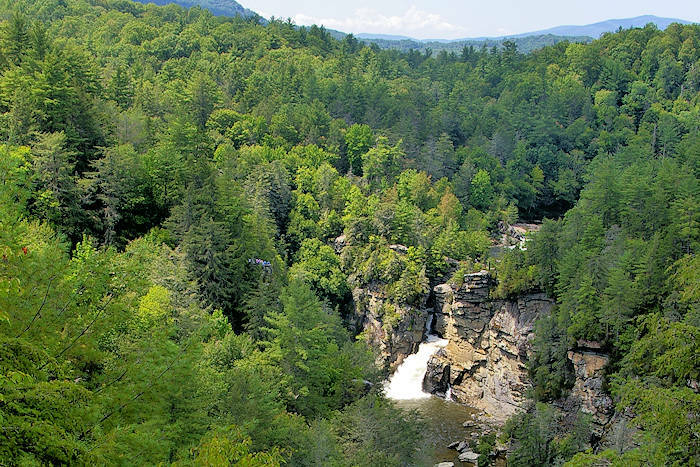 From this vantage point, get a panoramic view of the Linville Gorge and a distant view of the upper and lower falls. The trail does climb some more, and it's a bit more strenuous. There are two overlooks at Erwin's View. The first is on the right with a view of the gorge downstream. From here, climb up to your left just a short distance to the main overlook. It's on top of a large, flat-topped boulder which you'll reach by climbing up a set of stairs. Elevation here is 3330 ft., the highest point on the hike. Return to your vehicle on the same trail. Linville Gorge Trail is the more challenging trail. From the Visitor Center, it takes you down into the gorge 3/4 of a mile to the base of the waterfall. The trail includes many steps and a few steep climbs as you near the river. You are rewarded by close-up views of the rock cliffs and plenty of big boulders to relax on - even have a picnic by the Linville River. No swimming is allowed (currents are too swift), but you can get your feet wet. Relax to the soothing sounds of the waterfall and river. The same trail takes you to the Plunge Basin Overlook (1/2 mile from Visitor Center). Watch for the side trail that forks to the right and descends to the stone overlook for a view down on the falls and pool. An easy 3/10-mile hike from the Visitor Center takes you to a small cascade. Read more about Duggers Creek Falls. From Asheville, you can take the Blue Ridge Parkway north for about 66 miles (when the Parkway is open - read about possible Parkway closures) to Milepost 316.4. The Parkway is closed much of the winter in sections between Asheville and Linville. This is a spectacular, winding, leisurely drive. Allow two hours. A quicker way will take about 1.5 hours (about 75 miles) by taking I-40 East to Marion, get off on US Hwy 221 exit in Marion and head north. Take 221 all the way to the Blue Ridge Parkway (passing Linville Caverns), head north on the BRP and the right turn for Linville Falls is about a mile down. Coming from east of Morganton on I-40, you can take exit 103 which is Hwy 64. Head east, back towards Morganton. Follow the 64 East Truck and Bypass Route until you get to Hwy 181 North. Take this left turn and take 181 North to the Blue Ridge Parkway. Turn left (south) on the BRP and drive a few miles to the left turn for the Linville Falls parking. During the winter, the Parkway at the Linville Falls Visitor Center is closed when there is snow and ice on the road. But never fear! You can access the hiking trails from the Linville Gorge Wilderness Area Parking area near US Highway 221. 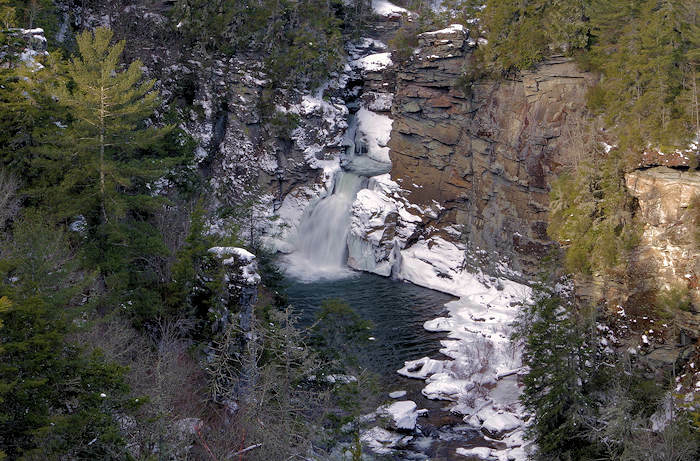 See our Linville Falls Winter Hike Guide. Find More: See our Top 12 Parkway Waterfalls. Nearby are Crabtree Falls and Chestoa View. And hikes to the summits of Hawksbill Mountain and Table Rock Mountain, overlooking the Linville Gorge. Go to the Burke County website for more attractions and great places to stay. 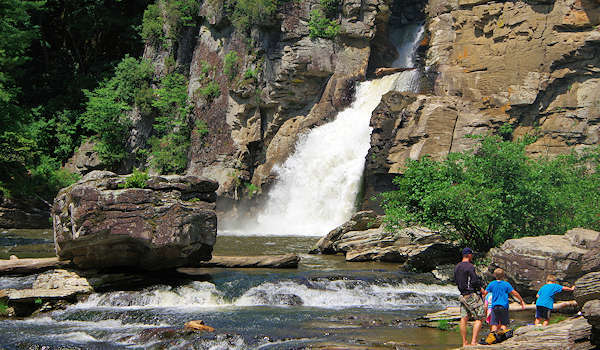 Download the Blue Ridge Parkway Linville Falls Trails Map. 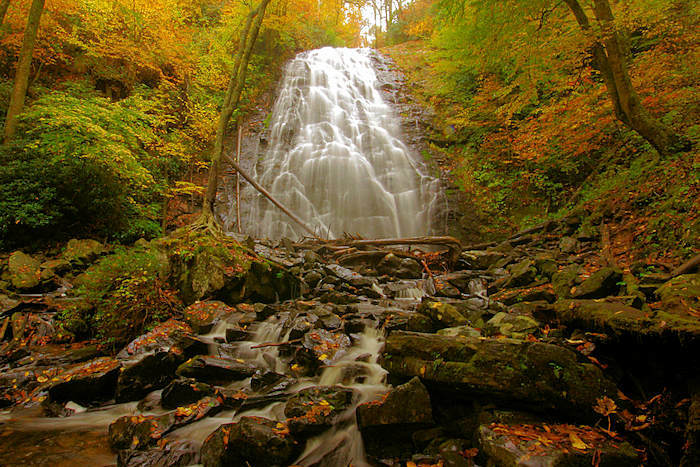 For more waterfalls, see Blue Ridge Parkway Waterfalls and Waterfall Drives & Maps.